Weaving, embroidery and piecework are powerful means of cultural expression. Through their traditional textiles, the artisans recount the stories, motifs and rhythms of their lives. A Bolivian weaver, for example, may portray her village's yearly calendar. A Palestinian refugee maintains her connection to her village by embroidering its signature motifs. The artisans are organized in many ways. Often, they work in cooperatives, economic development initiatives and nonprofit organizations. Sometimes they are employed by private, progressive, fair trade companies. We buy from individuals as well. 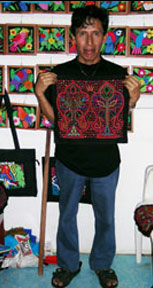 Crossroads Trade actively seeks out artisans using traditional motifs and techniques. 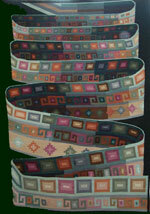 Our textile pages highlight this traditional work. At the same time, we help maintain those traditions by developing contemporary uses for the traditional work. A traditional weaving, for example, might be used as a panel on a purse or Christmas ornament. 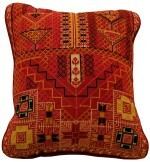 Purchasing ethnic textiles is one of our biggest challenges at Crossroads Trade. Import regulations are arduous. Textiles are usually excluded from trade treaties with other countries, and the costs to bring them in are very high. Still, the textiles are so compelling that we can't pass them by! In addition to what you see on the website, Crossroads Trade carries other textiles as well, such as Cambodian and Guatemalan ikat yardage and sari fabric by the yard. Our offerings change frequently. Please contact the store for more information, at 617-975-2001, or email info@crossroadstrade.com.